How to make economy class feel like first. Let’s face it, travelling in business or first class is out of reach for most of us. But our jet setting editor Leigh-Ann Pow has picked up a few tips along her travels to make economy feel like first class (or at least premium economy) without the expense. As the name suggests, we here at International Traveller do our fair share of travelling internationally on a yearly, monthly, and sometimes even weekly basis. And while we are lucky enough every once in a while to find ourselves in the lofty surrounds of Business Class (and, on at least one occasion in the past, at the pointy end in First Class) we actually clock up most of our air kilometres in economy like the vast majority of modern voyagers. As airlines around the world spend up big on brand new plane designs that promise more space, bigger windows, better air quality and smoother flying, and technology provides invaluable access to scoring everything from preferred seating to palatable meals, it’s becoming ever easier to get a first class experience out of an economy class fare. So, read on for the tips and tricks we have learnt along the way that make economy class seem less like a second class option. 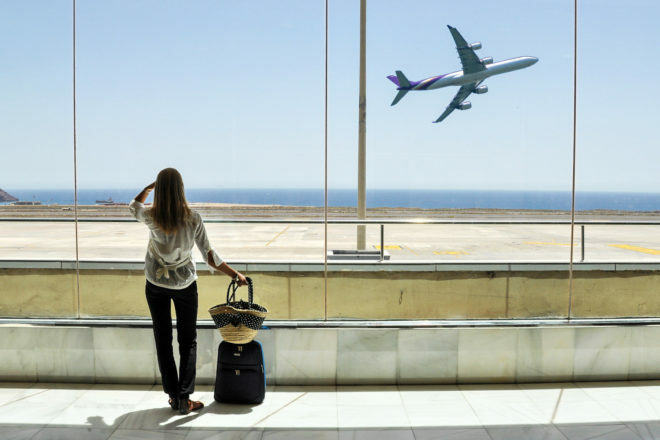 Opt for the online check-in option offered by most airlines these days and you can check in for your flight up to 24 hours before flying, choosing your own seat and printing out a boarding pass. Take your time and choose your seat carefully; choose an aisle seat if you want to be able to move around easily, and chances are if the flight isn’t choc-a-block full you will end up with a seat to spare in between yourself and the person in the window seat. The same goes for the middle block of seats; if you book the aisle seat on a row of three or four and it is a less busy flight, you may find the two middle seats on your row will be left free and you will have more room to stretch out. With your seat allocation and boarding pass taken care of there’s no need to stand in line at a check-in desk: use the quick and painless baggage drop off option being offered by most airlines or try to be sophisticated with your packing, fitting everything into a carry-on bag that can be wheeled on and off a flight in a flash. If you find yourself travelling regularly, it’s a good idea to invest in a club lounge membership with an airline as this will allow you access to the business class lounge without the necessity of a corresponding business class fare. Choose an airline that has lots of reciprocal partners and you will be swanning into lounges here, there and everywhere with the flash of a card. Once in you’ll get all the perks, from hot and cold treats to shower facilities. Most international airports worth their weight in complimentary tea and coffee these days have Pay In lounges, allowing travellers to enjoy all the benefits of membership without the membership! A shining example of the come-one-come-all lounge is Singapore’s stunning JetQuay service, which goes way beyond your standard business class lounge, collecting passengers on arrival, transporting them through the terminal, collecting their baggage and allowing them to clear customs in the plush surroundings of the lounge itself, all for a reasonable fee. More standard options feature comfortable seating, snack options and shower facilities. Bulkhead seats – the row of seats at the front of each cabin that face onto a partition wall – are much sought after, providing as they do ease of movement, extra room to stretch out in and no possibility of anyone reclining back into your dinner as you’re eating. While the leg room available in these seats varies depending on the plane model (recently on a Cathay Pacific A330-300 Airbus I could stretch out my legs and barely touch the wall in front) there is sometimes a trade-off in seat width, with meal trays tucking away into the armrests. Some airlines charge a small premium for these seats, but it’s worth enquiring if they are available when checking in because you may just score them for free. Many airlines are tweaking the configuration of their economy cabins, introducing a number of rows with extra pitch (that’s airline lingo for leg room) that can be purchased for a relatively small charge. Hawaiian Airlines’ Extra Comfort, for example, is a section of seats on its Airbus A330s that offer 12 centimetres of extra legroom, as well as priority boarding and additional amenities. Reclining beyond 120 degrees is possible in economy! Air New Zealand’s fab Skycouch on flights from New Zealand to LA and London gives those travelling in the seats adjacent to the window the option of creating a flat surface that stretches the length of three seats (155cm long and 74cm wide) with the flick of a button, which raises the foot rest to join up with the seat. When booking your flight online, click on the Special Requirements drop down menu and choose from a selection of meal types, including gluten free, kosher, salt reduced, kids, vegetarian, and the rather uninspiringly named bland food option (if you are booking through a travel agent mention you want a special meal from the start and double check it has been ordered for you by logging on to the ‘manage your booking’ option on the airline’s website). Special meals are hand delivered long before the meal trolley starts its crawl down the aisle and are often a lot more appetising than the menu being offered up to the masses. Menu options beyond ‘the chicken or the beef?’ are normally the preserve of business and first class only, but things are changing: Malaysia Airlines’ new MH Gourmet service allows guests to replace their meal with a fine-dining feast including a gourmet main inspired by Malaysian, Japanese or western cuisine, as well as an appetiser, dessert, chocolates and crunchy fresh bread for just $23. KLM and Air France offer à la carte meals on their intercontinental and long-haul flights, which can be paid for when booking or redeemed from frequent flyer points in the case of KLM. And when feeling peckish between meals, Qantas provide passengers with ice-creams to enjoy as well as help yourself snack bars on its A380s. And as if this added extra doesn’t take the cake! Malaysian Airlines has launched an On Air Celebration pre-ordered cake service for $83, complete with a personalised message to mark special occasions. At the other end of the spectrum, check out Etihad’s uber luxury class here!